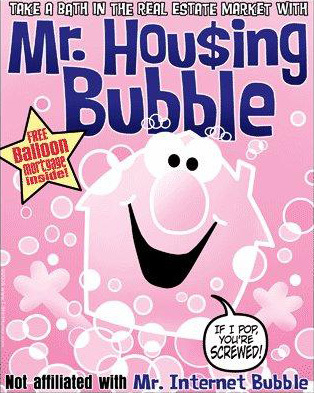 [Image: Mr. Housing Bubble; via Archis]. "Mount St. Helens is drumming out a warning beat," New Scientist reports. "Regular, repetitive earthquakes around the volcano are being triggered by the movements of a rock plug, reverberating in the neck of the volcano." Incredibly, the plug is moving upward "at the rate of about 3 to 5 metres per day," pushed from behind by "magma pressure" – which "could signal the build-up to some kind of eruption." On the other side of the world, meanwhile, Mt. Everest's frozen peak is apparently sucking ozone out of the stratosphere; the ozone then cascades down the sides of the mountain in "katabatic winds," or walls of cold air propelled downward by gravity. At its worst, these winds are "equivalent to mildly polluted city air and could pose respiratory problems" for climbers. Sticking with New Scientist, we then learn that there are possible links between oxygen in the atmosphere and the pace of animal evolution – discovering, in yet another article, that too little oxygen can actually lead to Alzheimer's disease. In other words, it seems like non-senile humans are only possible on this planet within a very narrow range of oxygen saturation. So don't forget to breathe. 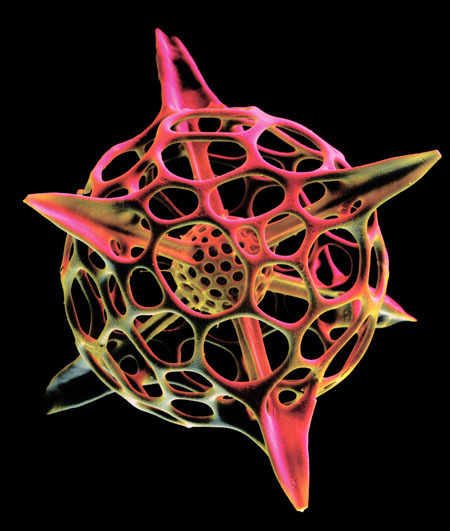 [Image: Photo by Manfred Cage, via New Scientist]. Then there's the ongoing possibility that we are already surrounded by thriving alien lifeforms – only we don't know how to spot them. "What if life elsewhere is different," for instance, "based on an exotic alien anatomy and biochemistry?" Our planet could thus be teeming with organisms so alien that they don't even appear to be alive. This is a familiar topic on BLDGBLOG; see Unrecognized for what they are, or (the identically illustrated) Alien Planet. 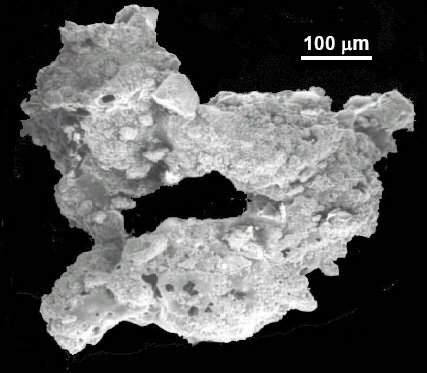 In other landscape news, scientists have developed artificial moon dust – a material otherwise referred to as a lunar simulant. The scientists simply "don't have enough real moondust to go around," we read, so manufacturing a replica was the only way to go; they've now "also begun work on more demanding simulants representing various locations on the Moon." Word has it, there is someone on the moon right now, building a small replica of the Earth... within which a small replica of the moon is under construction. 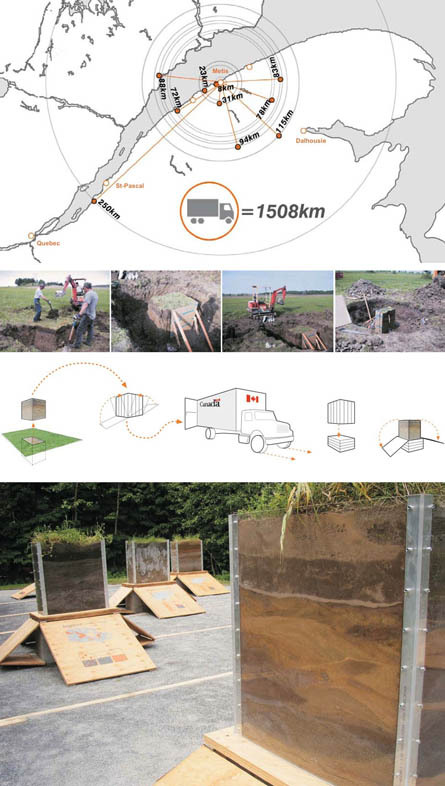 For some reason, though, the lunar simulant story reminds me of Lateral Architecture's "garden of soils" project – in which intact, three-dimensional samples of soil from throughout Québec were collected and publicly displayed in rectilinear containers, forming what look like colored chimneys of red and brown earth. It's the surface of the Earth, transformed into a readymade art object. [Image: From Soil Horizon, 2005, by Mason White and Lola Shepherd of Lateral Architecture. This project is also featured in this book]. Meanwhile, don't forget the "storm the size of a planet" now whirling its way across Saturn's south pole, complete with "a well-defined wall of towering clouds ringing a dark eye." I continue to believe that the landscape architect of the future will somehow learn how to cultivate weather: microclimates and permanent storms hovering over desert gardens... A storm the size of a planet would simply be icing on the cake. 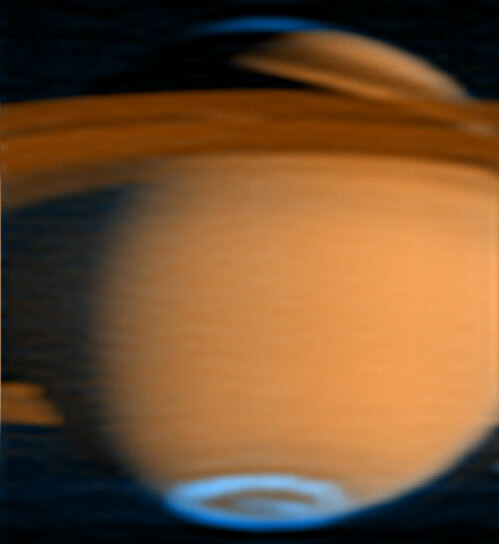 [Image: Polar auroras on Saturn, via Space.com; this is not the "storm the size of a planet," on the other hand – I just like the picture]. Yet controlling the weather isn't as far-fetched as it might sound. They're already doing it in Beijing, for instance; and, here in California, the use of "hail cannons" appears to be on the rise. The Ventura County Star describes how a "thunderous boom from a 20-foot cannon echoes over John Diepersloot's apricot and peach orchards... breaking up hail stones before they can form." Specifically, hail cannons, "which switch on when storms are approaching, are the latest high-tech device aimed at protecting crops from the volatile weather that hits California's agricultural heartland, where a single hail storm or freeze can destroy a crop – and a local economy – overnight." 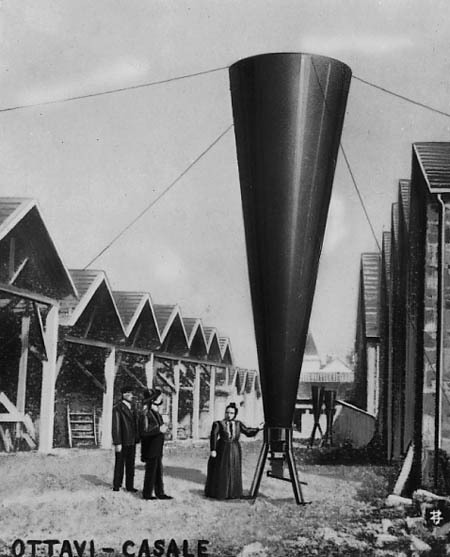 [Image: A 19th-century hail cannon; see also that site's look at Using Energy to Forcefully Alter the Weather]. It seems that "surveillance cameras in the city of Groningen have been adapted to listen out for voices raised in anger. 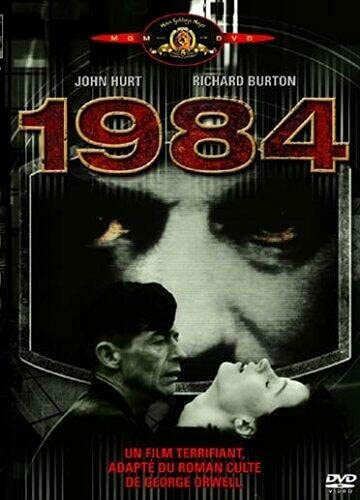 Microphones attached to the cameras feed the sound signals to software that can detect voices that are aggressive in tone." Though this is supposed to "prevent fights breaking out," it will probably: 1) do nothing of the sort; 2) have an unexpected deadening effect on conversations throughout the city: whereas two friends might once have passionately debated the literary merits of Jonathan Franzen, now they will just shrug defeatedly, break eye contact, and order more beer; or 3) 15-year old boys making loud farting noises will take over the streets at midnight. Not to be deterred by such cynicism, the forces of surveillance have also developed a "device the size of a laptop that can see through walls." This "will leave criminal suspects no place to hide from police or security forces." [Image: The Prism 200, courtesy of Cambridge Consultants]. The so-called Prism 200 system "uses radar to detect moving objects on the other side of a wall, and displays their position in three-dimensions on a built-in screen. It is sensitive enough to detect a person breathing," we're told. Perhaps implying a future use for architectural design students, the Prism 200's "through-wall radar" technology "can map an area in plan view, side view or in three dimensions." 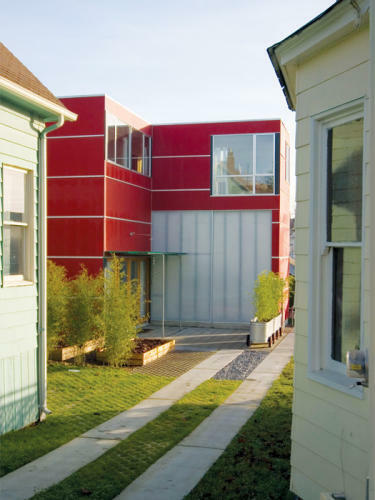 Recently Portland and Vancouver established zoning and design guidelines to encourage the development of smaller houses, as long as they meet exacting design criteria. A new program in Vancouver that falls under the mayor's overall policy of "eco-density" encourages the reconfiguration of lots in certain single-family districts. In Portland a new set of ordinances and guidelines seeks to promote "skinny houses," intended to fit lots less than 36 feet wide. [Image: An example of "neighborhood intensification," or building smaller houses on smaller lots. Photo by John Morefield, courtesy of David Sarti, via Metropolis]. Speaking of the phrase "skinny houses," articles continue to appear debating whether architecture can make you fat. The Guardian, for instance, reports that England's Commission for Architecture and the Built Environment recommends that architects try "designing cities and housing that encourage exercise." The reporter immediately sees "an image of a futuristic metropolis fitted with endless MC Escher stairwells and humiliatingly narrow doorways," but the real solutions are much more obvious than that. Architects and urban planners can start by "incorporating cycle paths and pedestrian areas into their designs," for example. "Parks and other green spaces encourage people to exercise, and if a shop is within walking distance, people are more likely to leave the car behind." Etc. All of which reminds me of a more or less unspoken theory about contemporary urban space: which is that we don't need so many countless thousands of roads and parking lots in our cities because everyone drives a car; it's that everyone drives a car because there are so many countless thousands of roads and parking lots in the way. You can't get anywhere for all the parking lots surrounding you – and so you have to buy a car just to get out of there. 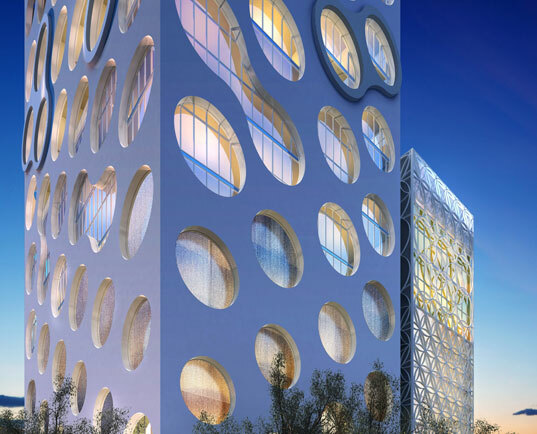 In any case, Inhabitat introduced us last month to a new high-rise project in Miami, designed by Chad Oppenheim. The building incorporates wind power into its very facade. 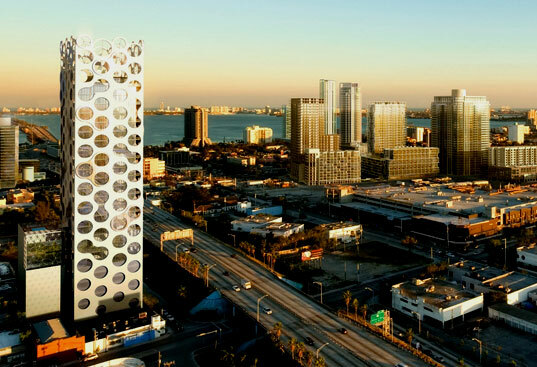 [Images: Building by Chad Oppenheim; images via Inhabitat]. As Inhabitat writes, the building works by "integrating green technologies including wind turbines, photovoltaic panels, and solar hot water generation" into its structure. The outer "exoskeleton" is really "a hyper-efficient structure that provides thermal mass for insulation, shade for residents, and architectural elements such as terraces and armatures that support turbines." It also looks good at sunset. 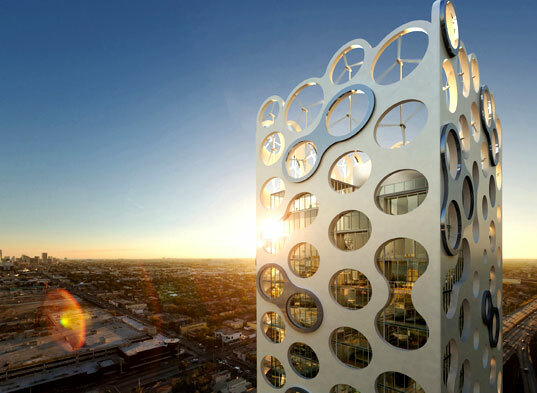 [Image: Building by Chad Oppenheim; image via Inhabitat]. However, this building also makes me wonder if the public's negative reaction to wind farms might be different if we used more attractive windmills. In other words, instead of those free-standing, vertical helicopter blades – as most farms now use – why not try a sleek line of embedded turbines... a kind of Great Wall of Wind Power stretching across the landscape? In the arches of bridges, turbines. Finally, BLDGBLOG's Sitemeter quietly ticked past the 1,000,000 visitors mark this past Friday; thanks to everyone who comes through now and again – hopefully it's worth it. Expect more news about that soon. (With some of these links supplied by none other than Alex Trevi). I don't think the main problem with wind turbines lies in the way they look, as they're already less intrusive than a radio/cell tower or a set of high-tension lines. I actually *like* seeing those small clusters of slowly-turning windmills on hilltops when I drive through the countryside. 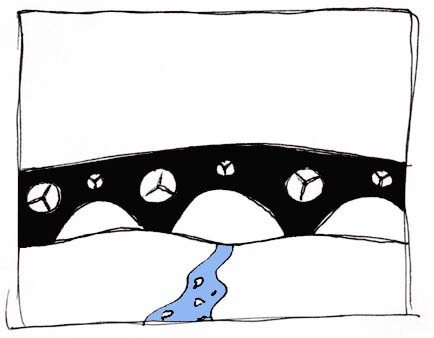 "why not try a sleek line of embedded turbines... a kind of Great Wall of Wind Power stretching across the landscape?" Wind turbines tend not to work well when placed next to eachother - apparently no one is really sure why this is. Whether this effect would be helped or hindered by embedding them into a wall I'm not sure, though. "Proven with: brick and block separated by a cavity; timber; cinder block; concrete block; 9" brick; reinforced concrete (subject to reinforcing bar spacing)"
Clearly it has a problem with metal disrupting the scan. Would it also be hampered or blocked by steel framing studs, metal stucco mesh, aluminum siding, foil-faced insulation, electrical wiring, etc.? How about good old kitchen aluminum foil taped to the inside walls of a room (or its inhabitants)? Home privacy designers might create new and decorative ways of automatically dispensing foil chaff throughout a home, or, to keep out all EM snoops, simply move us into Faraday cages. OTOH, let's just get naked, install BB viewscreens in every room, and live with it. Police Officer: Sir, are you classified as human? Shouldn't the hail cannon photo caption be changed to indicate that they are from the 19th century? Oops - yes, you're right. Thanks for spotting that! they rely on the free flow of air around them. the wall would, and the building will, reduce the effectiveness. even being near each other is enough to turn the wind into eddies that push the blades many ways at once, which is less good for generating energy. other trouble with wall is that it brings back the problem of offering birds nice places to (try to) sit, which is partly why modern turbines sit on skinned poles instead of the old naked lattices. however, combining the heat generated by the sun on the tarmac with the flow of the air beneath a bridge implies that solar-powered jet engines could be used to stabilize, lift, or even relocate bridges. something to set aside.